It'll often happen that I'll start half a dozen projects all in a row, and a few months later I'll come back to them. I think it's necessary to my creative flow-- I can't go be too productive or I feel like a sweatshop of one. So I fussed around, cut up three t-shirts (which I haven't sew back together yet), made a couple patterns, cut a few pieces out... and did, surprisingly, finally finish a few things. Not in time to post when I usually do, but I'm here now and that is what counts. My cousin's daughter Eva's birthday (keep track of that list!) is the same day as my mom's (March 20, first day of spring! ), but her party (Eva's, not Mom's) was on Saturday. She's turning 1. I scrambled a bit on Friday night, but I came up with this little summer dress out of a t-shirt. 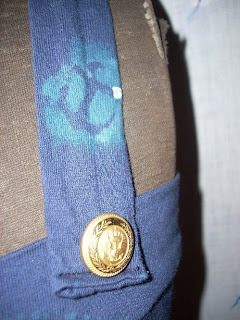 I'm sure you can recognize the fabric from a different project. I do realize this is a bad quality photo, but it's all I have. (And I couldn't very well model it!) Maybe someday I'll have a picture of Eva herself modeling it. Anyway, on to the pictures. The corset fits Doris rather ill-- what can I say, humans are just more squishable! 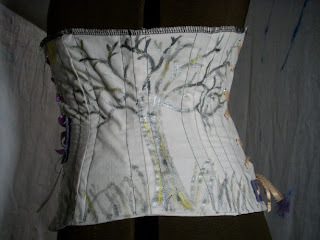 You can clearly tell the tree design was practically stolen from the other corset. Um... oops? I finished this one tonight, but I was disappointed to find that it just doesn't fit me quite right. 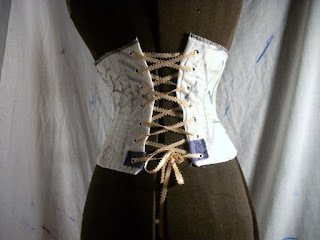 I don't need another corset anyway. I learned a couple things making it, however, such as why I maybe shouldn't try the chaos stitch on my rattle-y machine when people are trying to sleep. I'm sending it off to a friend who will hopefully get more use out of it than I could! 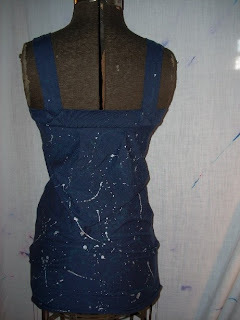 Ah, sweet fun with fabric paint. Here's a top I made out of an old t-shirt a while back. 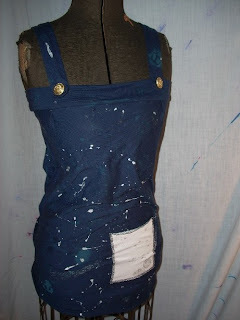 It's got a bit of a sailor theme to it, but to make it funky and chic, I splattered bleach and silver paint all over. This one's probably going to end up in the shop when it opens. I went a litte crazy with the paint, as you can see, but it was just so fun! Yay, another blog! Eva is going to love that dress, and she will be the perfectly adorable model! 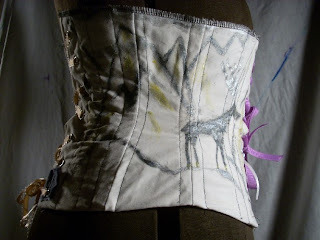 Ha, its comforting seeing YOU (the talented seamstress) are bothered with unfinished projects as well. How encouraging. :P What lovely projects! Keep at it and don't give up! Your sewing skills are much better than mine, I must say! I'm currently making a 50s style Butterick wrap dress.... but it is supposedly "Very Easy". Right. Aww, thanks. Oh, I adore 50's style dresses! How's it going? I'd love to see pictures if you get a moment. My email is Addikins@gmail.com, drop me a line!